Bill Holden, a well-known surfboard shaper who helped mold the sport into what it is today, died recently from a heart attack. I had the pleasure of meeting Holden a few months back at this year’s Surfboard Builders Hall of Fame. His smile was ear-to-ear as he talked about his early days shaping board for Holden Surfboards back in 1955, when his creations would go for $50 a piece. These days, some of the classic boards can go for thousands of dollars. Holden, creator of Holden Surfboards on Beach Boulevard in Huntington Beach, was a good friend of famous surfboard shaper Dale Velzy, among other surfing icons. Surfboard shaper Bob “the Greek” Bolen bought his first custom board from Holden, later buying his first foam blank from him. “He was kind of worried I would go into the business. I told him I wouldn’t, that I just wanted it to build myself a board,” Bolen recalled, chuckling. Bolen did go on to become a shaper, but the two would help each other with their work over the years. Holden held a lot of pride in the artistry and detail that goes into creating each board. “It’s like sculpting. It just gets in your blood,” he said during an interview a few months back. Holden, a Laguna Beach resident, was such a force in the shaping world that he was the first inductee into the Surfboard Builders Hall of Fame back in 2000. The award was given to him at his 70th birthday party, a surprise to all the guests. “Bill and his wife were so touched, both of them started crying,” recalled friend Mike Ester. Holden has attended every Hall of Fame ceremony since it started, clutching his award through the day and chatting with surfers who admire his work. “He was such a sweet, sweet man. He always had a smile on his face,” Ester said. Holden was an active member of the Longboard Collector Club, which will donate $100 to the charity to be picked by his family. Other local surfers have jumped on to match the donation. Holden was loading up a car for a Super Bowl party when he had the heart attack. “Bill was a good man, and really enjoyed life. He will be missed by everyone who ever came in contact with him,” said Roger Mann, president of the Longboard Collector Club. A paddle out will be held for Holden, but likely not until spring. This is another one of those columns that I do not want to write and news that I do not want to report. Another surfing legend has passed into the big point break in the sky: Huntington Beach's own super-star surfboard builder Bill Holden. This dude was one of the original surfboard builders in Orange County and one of the most fun and stoked people you could ever want to come into contact with. Everyone he met came away with the feeling of warmth and stoke from this man, including myself. I admit to not knowing him all that well though. He was someone whom I looked up to when I was a kid and a guy whom I came into contact with from time to time over the years. Every time I saw him, it made me happy. He was one of those dudes who just had a light about him and a very contagious smile and laugh. Bill was the very first recipient of the International Surfboard Builders Hall of Fame award. Bob "The Greek" Bolan knew a lot about Bill and much of the history that went along with the fact that he had been building boards right here in Huntington Beach since the late '40s. It was he and Mike "da Ratt" Ester who nominated him for the Hall of Fame. His shop was on Beach Boulevard. He also was a dear friend of the late great Dale Velzy. "I sat down with him when we gave him his award at his 70th birthday party in Laguna at his home. It was an amazing experience. I talked with him for about a half hour on his life history. "Man, he was an innovator of some pretty cool designs and shapes in the industry. Nobody (about 150 or so) at the party knew anything about the induction. We wanted the first recipient (it was in 2000) to be originally from right here in Surf City. "We set it up that the person inducted then picks the next inductee. We figured he would pick Dale Velzy, which he did. Then of course, Dale picked Hap Jacobs, and so on. "Let me tell ya, he was sure surprised and totally stoked to receive the award. He has come to every award function since the first one and has brought his award with him every time. Now that is stoked! "He always had a smile on his face. What a sweet, sweet and happy guy. If any of you were at that 70th birthday party, you will remember how stoked he was to receive that award. You know he said that he was extremely bummed that Dale Velzy went to surf heaven before him. "Bill nominated Dale to be the next inductee out of sheer respect and love for the other surfboard legend. They were dear friends. Well, now they are together and can talk stories for a long, long time! "I'm going to miss that icon. Greek and I will make sure that his award will be present at the next award presentation. So much history, and such a great man. "Bill was an icon of the industry and a wonderful and cheerful man. Bill and his family were very active in the Collector Club and did a wonderful job with the big barbecues at Doheny State Park for our large annual event. "The Board of Directors unanimously supports a contribution in Bill's name. The Longboard Collector Club will contribute $100 to the charity the family chooses. We recognize Bill as one of our own and send our deepest regrets to his family and closest friends. "Bill was a good man and really enjoyed life. He will be missed by everyone who ever came in contact with him." "Our family is having a very hard time with his passing, even though we know that is the last thing he would have wanted. It has been a pleasure to have been raised by and to have known such a wonderful man. "He touched everybody's lives in different ways and because of that I know he will always be remembered. He would want us to remember him with laughter and not tears as he always had a smile on his face. "A memorial service is tentatively planned for the end of February or beginning of March and a paddle out in the spring." On Super Bowl Sunday, legendary surfboard maker Bill Holden was loading up his latest creation, a sleek square-tailed thruster decorated with a lyrical line drawing of a surfer girl. The Canyon Acres resident planned to show off the newly finished board at his son's annual football party. After placing the board into the bed of his truck, Holden, 77, collapsed, succumbing to a massive heart attack. The founder of Holden Surfboards of Huntington Beach, Holden first started making surfboards in the mid-50s and was instrumental in defining the shape and look of the classic long board. Holden was so instrumental in the world of surfboard making that on his 70th birthday, May 20, 2000, he became the first inductee of the International Surfboard Builders Hall of Fame, created to honor icons of the surfingindustry. Each of his boards is considered a work of art. "I've seen hundreds of his surfboards and no two are alike," said Vito Cachia, a foot and ankle surgeon from San Juan Capistrano who owns seven Holdens. "Each board is the embodiment of his personal attention to that board and the person he was making it for. He put his heart and soul into every board he made." Holden and his wife, Melanie, at Old Man's at San Onofre State SurfingBeach, where Holden's admirers erected a shrine of boards he had made for them, surprising him on his 75th birthday. Besides being beautiful to look at, "fun" is the word that best describes how a Holden board surfs, Cachia said. "They're wave magnets." Born in 1930 in Covington, Ky., Holden and his family moved to California in 1947. He started surfing at San Onofre in the 1950s right after he got out of the Marine Corp after having served in the Korean War. In 1955, while working for Glasspar Boats, he shaped his first board out of Styrofoam, using a foam flotation bun. While it surfed, the foam board broke easily and swelled in the sun. Looking around for a better wave tool, Holden found Dale Velzy who was selling his balsa wood boards for $87. Not wanting to spend that much money, Holden, a lifelong do-it-yourselfer, traded two tires that his father had recapped, for a blank. He shaped it on the beach of his favorite break, Old Man's, taking suggestions from old timers standing around. Each surfboard was embossed with the fun-loving Holden logo. After that first encounter, Holden and Velzy, who by the 1960s became one of the world's most prolific surfboard manufacturers, became life-long friends. Velzy died in 2005, also at the age of 77. While attending Orange Coast College, Holden set up a board building operation in his dad's garage in Garden Grove. During the 1960s, he was shaping as many as eight long boards a day at his shop on Beach Boulevard. According to his longtime friend, Steve Hammon of Mission Viejo, Holden wasn't motivated by money, but by quality and whether or not his creations pleased the recipients. While his contemporaries charged $600 to $800 for a board, Holden's price tags would read $300, though he'd put more than 20 hours into a project. In recent years, he often simply gave the boards away. On his 50th birthday, Hammon received a black board "shiny like a Corvette" inscribed with RIP across the top. "He was a giver," Hammon said. Cachia, too, received a gift from Holden on his 50th. Made of foam, palm, agave and redwood, Cachia said the board, which hangs in his office,is "absolutely beautiful. It is a token of friendship that I never have quite gotten over. I am so honored to have had him as a friend." Embossed on each board is Holden's logo: four grinning gremlins racing towards the surf, boards in hand. His motto: "Everywhere…There's a Holden board" led to ads in Surfer magazine in which his boards would be pictured in a pit of crocodiles, in bed with a woman and atop a skyscraper, anywhere except in the ocean. In the '70s when long boards gave way to shorter boards, business declined. For a time Holden manufactured boards and bras in Puerto Rico and developed a plastic wax package that could be closed tight after use, preventing surfboard wax from melting in the car glove box. Until he retried in 1992, Holden worked as a machinist for a print shop in Santa Ana. In the '50s Holden and friends built the ultimate Baja vehicle, The Duck, an amphibious marine vehicle that they topped with a San Clemente school bus. The remains of the vehicle, which made countless surf safaris to remote Baja beaches, are currently rusting in the sands of Bahia de los Angeles on Baja's Sea of Cortez. According to his son, Brad, of Mission Viejo, Holden was a "die hard Marine" who always wore his dog tags and a Marine Corp ring which he made out of gold he had panned near Sacramento. Holden enjoyed a resurgence of appreciation in his work when in the late 80s long boards again became popular. He continued making boards for family and friends up until his passing. "It's like sculpting," Holden said at last year's gathering of the legendary shapers at Sunset Beach. "It just gets into your blood." Inside his shop on Canyon Acres where he lived with his wife, Melanie, for the past 30 years, Holden left his glasses on a partially shaped foam blank he planned to work on the following day. "He was just going away for a minute to eat chili and be with his son," Melanie said. "He worked everyday in his shop." The afternoon tradewinds blew warmly from the southeast. Taveka trimmed his sail and sighted down a broad passage through two reefs. The southwest swells rolled under his voyaging craft with a steady motion. At this rate he would be home just after dark. Now that David had succeeded him as chief navigator of the Maruleans, he did not have to take part in the preparations for the rituals marking the beginning of winter. With nothing to do, he did as he pleased. He went sailing off in a random direction, and when he found what he was looking for, he went surfing. He found fun waves to surf at a remote shoal near the far edge of the fishing grounds, leaving him to think about what life might have been like for him had he started surfing as a young man. 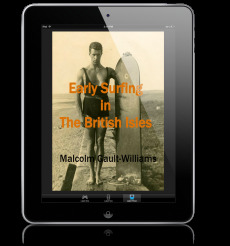 He thought of what David had told him about Rabbit Kekai and Woody Harrison, men who had begun surfing before World War Two and continued to ride waves well into their nineties. Like them, he had discovered the peace of riding waves as a way to stop time. Now he was sailing away from those waves to face the passage of time once again. The only Marulean tradition marking the passage of time was the ceremony of the winter solstice, and this one would be his last. A strange sensation of melancholy passed through him, like a cross swell slapping the side of a hull. The moment passed quickly. He was a navigator and his mind could pay little heed to such thoughts. His gaze was to the horizon, feeling the wind, current and swells, sensitive to any signs of change. A dot of color caught his eye far ahead and slightly off his port bow. He maintained course until he was no more than thirty yards away. At first it reminded him of his youth during the war. More often than not a floating lifevest had contained the last remains of a corpse torn apart by sharks. It had always been a grisly task to get the dog tags or anything else that could be used for identification, but he did it by remembering that the anguish of families would be relieved by his retrieving something that could give them closure. And now, even after six decades had past, something inside him prepared for the worst. Then he saw that the lifevest was empty. He altered course slightly and pulled the vest out of the water. It was not covered with algae or moss. It had not been floating at sea for any great length of time. He considered just how it ended up in these waters given the currents, winds and wave patterns of the Nebula Archipelago at this time of year. Then he remembered what David had seen in the sky over Ka’unua. As Taveka’s voyaging craft came through the passage, he was surprised to see almost the entire population of the Marulean sea people waiting for him. Normally they would all be at the southern end of the island preparing for the solstice ceremony that would begin in an hour, now that the sun was on the horizon. He came closer to the shore and a dozen young people swam out to the voyager and scrambled aboard. They surrounded him with hugs and smiles as if he had just returned from a voyage of many years. The craft drifted ever more slowly until its forward hull finally kissed the sand. Taveka looked at the crowd, all silent yet all smiling at him. Then Kalala stepped out into the water. “No, I have yet to see the albatross, Kalala, so I went surfing. How else is an old man supposed to find some peace and quiet around here?” he laughed. The solemn homecoming quickly dissolved as happy children turned the voyaging craft into a place of play. Some began diving off the stern of the voyaging craft. Others began chasing each other around the decks. One discovered something he’d never seen before and with an innocent curiosity showed it to his friends as he tried to put it on. “Of course, Kalala, but first you need to do something about these children!” They both laughed and Kalala clapped her hands. The boy dropped the orange lifevest where he’d found it and with all the others jumped into the warm water before joining his parents. Everyone began walking to where the solstice ceremony would take place at the southern end of the island. Only Taveka’s own family remained behind as he stepped off his craft and came ashore. Luan hugged him and her children wrapped themselves around the legs of their grandfather. He picked up a child in each arm and looked at their father. But David Helmares was eyeing the object on the deck of the voyaging craft. They left David standing next to the voyaging craft. He saw the elders following the crowd in the distance. He could catch up to them quickly. He had a few minutes. The lifevest was of an unusual design. It was similar to what he knew was used for water skiing, but the flotation partitions were narrower and smaller, as if the vest needed to be more flexible. It was surprisingly lightweight, and he felt some hard objects in its storage pockets. He pulled open a velcro flap. Inside was a small round plastic case labeled in white letters embossed on black plastic tape: ‘Contrast Filter – Property of Bobrowesurfphoto.com’. His mind began to race and his heart felt torn in two. He began to open a second pocket, but then stopped, realizing he’d already learned all he needed to know. He put the case back in the pocket and the vest inside the dome shelter. He knew he could not be distracted before the ceremony. He had chosen a new life with responsibilities to a people living far from the madness of modern civilization, though now much closer than they had once had been. The next day David found his mentor mending some lashings on his voyaging craft. The fact that its owner’s time was short was no reason for the craft to be allowed to decay. Taveka was as focused as if he had been planning a multi-island long distance voyage of a thousand miles just for the pride of doing so. David sat down in the sand and watched the aged hands pull strong on the sennit cords. He automatically stepped in to help when an extra hand was needed, then sat back down until a second set of hands was required anew. No words passed between the two men. There was no sense of age, of youth, of teacher, or of student. They were simply two men of the sea with a task at hand needing no explanation. After an hour the work was done. Taveka went around to the prow of the craft. David thought he was getting ready to shove the tri-hulled outrigger out to sea and got up to help. Taveka held up his hand. The job would have been immensely difficult for the two of them. To David it was clearly impossible that Taveka could do it alone. Then David caught himself, knowing it was time to learn yet another lesson from a proud man with a sharp mind. Taveka sized up the distance to the water. He checked the tether between the canoe and its mooring tree. Then the old navigator went to the village’s common work shed. After a number of trips he had assembled a large cache of small bags, a dozen roller logs, a long, stout pole, and another log about twice the diameter of the rollers. He positioned the rollers around the hulls, and then positioned the lever and fulcrum near the first roller under the forward prow of the main hull. He then a dug a hole in the sand, lined it with a bag, filled it with sand, and then gathered the top into a knot from which he extended a sennit rope. He looped the rope around the end of the lever, and then used his weight to push down on the lever, raising the hull a few inches. He tied off the lever to the rope and positioned the roller beneath the hull. He repeated the process again and again until his voyaging craft was resting entirely on rollers. He positioned more rollers between the stern and the water’s edge. Each action was, in and of itself, nothing strenuous. Slowly but surely the craft was now made ready to launch. Taveka stopped and looked at the sun. Then he looked at the water’s edge. The tide had come in almost a foot since he had begun the process. It was not yet at its peak. Taveka’s look told Helmares the answer. He tried to soften the blow. Taveka saw the look of surprise on David’s face. David Helmares looked away to the horizon. David turned to his mentor. Taveka’s tone brought a smile to David’s face. Taveka winked at David and they both had to laugh. The smile disappeared from David’s face. Taveka knew David understood him perfectly but that there was still something else troubling his former apprentice. Taveka looked at the water’s edge and then looked David in the eye. Without breaking his gaze, he pushed the bow of the craft with a firm motion, launching it effortlessly down the slipway of roller logs into the quiet waters of the lagoon. David watched his mentor walk down to the water’s edge, push the craft further out into the lagoon, and leap aboard. 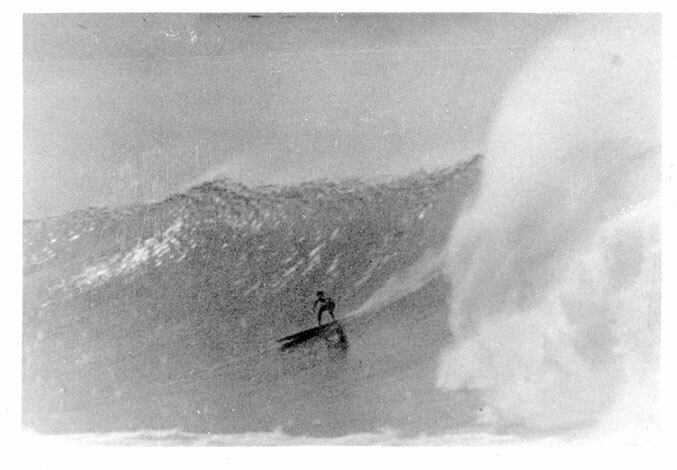 The surfing year 1963 was notable for the great changes taking place within our sport. Surfing was now popularized through Hollywood movies (mostly for the worst) and the surfer lifestyle was being defined by the emerging surf media. Veteran surfers were giving way to younger rising stars and surfing competition was helping fuel surfing's popularity and spread worldwide. This chapter in the LEGENDARY SURFERS collection has been reformatted for easier reading and printing. The people emerging from the long black limousines had been picked up by a Gulfstream V corporate at airports in Hawai’i and California, and now they were about to complete the last leg of their trip. Many had never seen the New York skyline etched against the twilight of a June night, and as they walked towards a private pier jutting out into the East River, they were captivated by the sight of the lights coming on in the City That Never Sleeps. A motor launch was waiting for them, as were two people in bright blue uniforms. “Why don’t we just shuffle ‘em up and everybody gets a different one this time?” said Heath Larson. The day of her epiphany at Wavelife, Cheryl Corlund had brainstormed a new business plan on her kitchen table with her family, the spiritual guidance of Dolly Artensa, and the business expertise of Bill Massara and June Wilson. The first thing they completed was a mission statement “Riding With Grace Means Family First”. It was clunky and still seemed to be about surfing, but it would do for now. Next, they answered two simple questions: Why are we doing this? What can we sell that people need? First, they focused on the why: and it was all about true aloha, that is, generosity and sharing. Ideas flew back and forth about changing life for the kids of South Central, aiding the shattered and the homeless in Southern California, giving hope to at-risk kids growing up wrong in Florida and Hawai’i, and changing the buying patterns of consumers who know the price of everything and the value of nothing. Then came the hard part: how to use capitalism to accomplish those tasks. After a lot of what-if scenarios, they came up with a plan to sell clothes at affordable prices to working families using designs and marketing campaigns that inspired self-discipline and self-esteem. Determining the corporate structure was next, and here they did something almost unheard of. The company would be owned by the Mother Ocean Foundation, originally set up for Aleja’s shelter, but now to be expanded under a business plan and public stock offering coordinated by Ben Jeffries. They began to pencil in numbers for a very tight, hardnosed, strictly business operation to compete in a market where the competition was already fierce. Bill and June tweaked the spreadsheets on their laptops and were eventually able to predict a decent return-on-investment for the backers and shareholders within a reasonable time frame. With a business plan penciled in, they now had to turn their attention to exactly what they would be selling. The motto’s words, “Family First,” gave them the idea of involving their families and friends right from the start. They quickly thought of putting everyone together for three days of focus groups, research and business plan development. It didn’t take long for them to decide exactly where they wanted to go after Mercante reminded his wife of their night on the Aeolusean. That decided, it was back to the office for them and Dolly Artensa to make calls, get their files in order, and pack up everything they owned in preparation for their last day at Wavelife International. “No, it wasn’t that bad, not compared to what you went through, I suppose,” said Dolly Artensa. They were sitting across from each other in the library an hour after everyone had come aboard and settled into their suites and guest cabins. But Artensa and Larson needed to talk about Cheryl Corlund, and there hadn’t been a chance on the flight across the country. Artensa smiled with a knowing look. The memory of his near death hit Larson right between the eyes, followed by another smack to the head at the thought of Cheryl Corlund giving him a chance to find his spirit again. That did it. Larson got out of his chair and walked towards the liquor cabinet. “It’s Ben’s private stock - the best Scotch I’ve ever tasted,” he said as he began to put some ice in a glass. Larson laughed and walked back with glasses in one hand and the bottle in the other. “May I propose the toast, Dolly? To courage and friends!” He poured from the bottle, they clinked glasses, and she took a sip. Artensa just laughed and they sat down. “I didn’t move, but Cheryl stops and says in a very clear, loud voice, ‘I am still the CEO of this company. You’re both fired. Now, get out of here! Security!’ she says, without taking her eyes off them. Larson looked at Artensa, downed the rest of his drink, and poured himself another. “I wish I could do that sometimes,” he said, finishing off his drink. Roberto Mercante rubbed his eyes, sat up in the bed, and looked at his wife sleeping peacefully next to him. He thought of when they’d started out together selling surf trunks and bikinis to small surf shops up and down the California coast. They’d built up a huge company, lost it all, and now they were going to start all over again, only this time for the right reasons. He bent over and kissed her forehead. She opened her eyes and pulled him down to her for a long, luscious kiss. And for the rest of the afternoon, the husband and wife were nowhere to be seen on board the Aeolusean. Nobody noticed their absence. They were all having the time of their lives on the megayacht. Dolly Artensa had brought along her two nieces, a nephew and his friend who had just been released from LA County Jail after doing six months for burglary. Aleja had brought two mothers and their children from the shelter, women who had come to the door with nothing and now had paid positions. June Wilson was with them talking about running the shelter while the children were in the pool with the kids from Hawai’i and the Massara children. Bill and his wife were talking with Bruddah’s niece and two of his cousins on an upper deck enjoying the breeze coming in off the summer Atlantic with the New York skyline barely visible in the distance. All the teenagers were in the games room where Sonny-boy Noaloa was showing a surprising talent playing ping-pong with Donny Mercante, who was no slouch himself. The boys from South Central couldn’t get enough of the pinball machines, while the girls sat with Anna Mercante and Aleja Gracellen. There was a lot of talk about life in Malibu, Orange County, and South Central, and how surprisingly similar things were when spirit and motivation were eroded by too much money – or not enough. Back in the library, Heath Larson was introducing Bruddah to the wonders of Jeffries’ scotch while they perused rare volumes containing original accounts of Captain Cook’s ill-fated voyages to the Sandwich Islands. But Bruddah didn’t laugh back. Larson wished he hadn’t said anything as he watched Bruddah get out of his chair and walk across the library floor and look out the window. Then his old friend turned around. The chopper set down on its retractable landing pad in the aft section of the Aeolusean. The engine was turned off, the blades slowly stopped, and a door slid open. A group of children burst down the steps, followed by Ben Jeffries and his wife. She and Robin Maguire took charge of grandson Pierce and his friends. Jeffries went straight to the main lounge to touch base with the people who were integral to the success of the next three days. Around dinner time a buffet was set out for everyone, including the staff and crew of the megayacht. When everyone had finished their food, Ben Jeffries stood up at one end of the deck and tapped a knife against a glass. The entire group went quiet, and that was exactly Jeffries’ intent. “To Heath and Cheryl!” said everyone in unison as they all took a draught from their glasses. Then Jeffries and the gathering sat down. Heath Larson and Cheryl Corlund stood up. The big wave surfer gathered himself and walked to the front of the room. Roberto and Cheryl gave each other a kiss. Their two teenagers were cringing – and happier than they had been in a long, long time. “You know, the last time I was floating on the ocean, I don’t remember much. In fact I don’t remember anything at all since I was just this far away from being dead,” he said with a wave and nod to Bob Rowe and Randy Laine who had missed the Gulfstream but had flown in first-class during the day, “In the instant before I went under, I was so full of myself that I lost all contact with a simple fact – that I was human, just like everyone else on the planet, and just like every one of you. I thought I was master of my universe, until Mother Ocean took over, and suddenly I was nothing. And even that didn’t matter to me then. Everyone clapped . . . and there wasn’t a dry eye in the house. Glasses were raised and most were drained to the last drop. He paused to let the thought sink in all around the room. The place was quiet for a second. Ben Jeffries stood up, as did everyone else. He shook hands with Larson, and the two titans gave each other a hug that would have crushed lesser men. “Geevum brah, we goin’ for it big time!” shouted Bruddah. Everyone broke out in laughter and applause as the two men stood apart and looked out over the deck. “Ok, Bruddah, now we go Big Apple!” said Larson. The lights from New York were glowing on the horizon, but it was nothing compared to the glow of human beings ready for a challenge that they knew could possibly change the world – even if only a little. Just about everyone was up early the next morning except one husband and wife who stayed in their suite and missed breakfast without a second thought. But when he heard an alarm clock built during World War Two coming in low to buzz the Aeolusean, Roberto Mercante made his sincere and profuse apologies to a not-quite sated Cheryl Corlund. He had a plane to meet, and she was beginning to understand his attraction to her first rival. Another figure emerged tentatively from the seaplane. She looked around before stepping on to the tender that would take them to the Aeolusean. Mercante stepped out of the way as the former world professional surfing champion gave his mother a long delayed hug and a kiss. Then Clem’s nephew emerged from the PBY along with his wife and three children. Mercante and Corlund had pulled out all the stops. They wanted every person that could possibly help them in planning their new business, including the owners of a mom-and-pop surf shop. And at Roberto Mercante’s request, Tommy Pratte had brought along some samples of his innovative surf trunks. Friday was a busy day mixing all the young people with their parents and guardians into focus groups on what was right, and wrong, with not only Wavelife but the entire retail end of the apparel industry. Saturday morning was spent perusing dozens of clothing samples that Corlund had “acquired” through her Seventh Avenue contacts. After lunch everyone went off to New York for a matinee show on Broadway and a fun tour of the city well into Saturday night. Sunday was relaxed and slow aboard the Aeolusean until the time came in the late afternoon for all the children and guests to go back to California and Hawai’i. But for the principals of the new company, Monday and Tuesday were spent hard at the grindstone. Augmented by a small group of industry experts, Corlund and her team put together the steel frame of a new company. And if “Riding With Grace Means Family First” did not quite resonate yet, they had another card to play when it came to courage and resilience. The surfers, the executives, the backer, and Clem Charleton were all in the library of the Aeolusean. Sonny-boy’s mom was there, too, sitting next to her son and re-claiming the role she once had as his best friend and surf coach. It took all morning to fully flesh out the after-action report of the events, from Larson’s brush with death to Ian Clark’s pitch meeting. When they were done, it was Aleja Gracellen who stopped them all in their tracks. Sonny-boy Noaloa knew the answer. His mom pinched him hard under the table. Everyone in the room did a double take. “I wasn’t watching that trip - - -” interrupted Noaloa. “Yeah, Heath, so we had to save your life because you were riding the wrong wave!” said Bob Rowe with an almost scolding tone to his voice. A few started to laugh but quickly swallowed their smiles when they saw the look of contrition on Larson’s face. “Well, Heath, maybe you should try again,” said Cheryl Corlund, stepping in for him at just the right moment. He looked at her but didn’t say a word. Her husband, though, did have something to say. Mercante’s excitement faded from his face as he realized just how expensive it would be to fly a PBY from Florida to Tahiti. Cheryl Corlund came to the rescue. “Well, that’s a lot of flyin’, so I’ll need to train someone in the organization to fly ‘er!” said Charleton. A groan went up from around the room until Aleja Gracellen brought smiles back all around. Tuesday night was the wrap up – and a special ceremony took place in the library of the Aeolusean. First off, the board of directors of the Mother Ocean Foundation: Cheryl Corlund, Roberto Mercante, Ben Jeffries, Aleja Gracellen, Bill Massara and June Wilson, voted to expand the board to include Sonny-boy’s mother, Clem’s son-in-law, and Bruddah, who vowed to make sure real aloha was always at the table. Next, the official document to launch the new corporation was presented to the board for consideration. Not only did it include a section based on the Valdez Principles concerning the earth’s ecology with respect to manufacturing, labor and materials, but it also established a commitment to the eco-psychology of the communities where their products would be sold. Cheryl Corlund and Ben Jeffries were convinced that corporate stewardship of basic human rights was good for business. For them, that meant establishing a presence in the marketplace by promoting values and behaviors that are less about buying power and ownership and more about a sustainable quality of life. They knew this was going to be no easy task. Using capitalism as a tool for altruism was akin to using a hammer to sculpt a flower, and they both made sure everyone understood the severity of the challenge. Everyone did, and no one flinched. The document that came to be known as the Aeolusean Agreement became the opening section of the articles of incorporation for a new kind of company. And the vote was unanimous.